As an actor, Paul Giamatti has remained predictable, at least for the majority of his career. Blessed with a certain carriage of rumpled intensity, his roles have gravitated toward men of rage or duplicity, often embodying eye-bulging discontent. However, when the actor finds a special role that demands dimension and an overall throttling of disease, Giamatti is unstoppable. "Barney's Version" offers such a challenge, gifting Giamatti a role of immense depth and mystery to explore in this outstanding, unpredictable drama. An oaf with a taste for romance, Barney (Paul Giamatti) hasn't had much luck with women, watching his first wife (Rachelle Lefevre) kill herself during a stay in Rome during the 1970s, while his second wife (Minnie Driver) cheated with junkie pal Boogie (Scott Speedman). Of course, little of his problems, including a detective's (Mark Addy) allegation that Barney killed Boogie, matter much to the television producer, who's found true love with the elusive Miriam (Rosamund Pike), developing an honest relationship with someone he actually respects. As life goes on, Barney tries unsuccessfully to halt his impetuous behavior, often seeking guidance from his father, former cop Izzy (Dustin Hoffman). "Barney's Version" is adapted from the best-selling book by Mordecai Richler, a story constructed in a specific manner that reflects the horrifying change in the lead character's mental stamina though the years. It's a challenging tale of betrayals, mistakes, and the brutality of time, yet screenwriter Michael Konyves does an outstanding job keeping the intricate elements of the narrative in play, preserving the literary progression of the piece without breaking the tale down into episodic bites. The film stays on target, charting Barney's life through failed marriages and various domestic aggravations, keeping close to the character without sacrificing the specific beats of his torment, embodied by a range of friends and family he can't seem to live without, despite his best intentions. Director Richard J. Lewis also keeps to a smooth, steady visual pace, holding on Giamatti as the actor finds a remarkable range of reactions, befitting a character who can't stay out of trouble. There isn't much work to be done with this gifted cast, yet Lewis creates needed tension out of Boogie's death and Barney's combustible temperament, creating the illusion of evil deeds spread out over his life, fashioning an odd mystery about a man who isn't what he seems. Lewis plays the film as a love story and domestic drama, doing justice to the complex nature of the writing by keeping viewers on their toes. The best compliment I can pay to "Barney's Version" is that I never really knew where it was going, remaining consistently surprised by its emotional resonance (potentially mawkish turns are gracefully explored) and biting sense of humor. 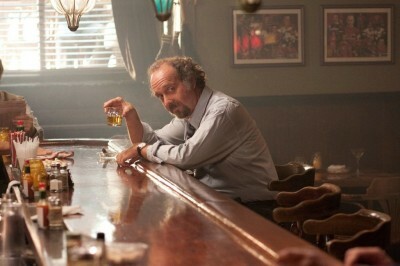 In the end, the film is at its finest with Giamatti, who provides a rich take on Barney's lifelong battle with himself. The performance is fiery, but also strangely vulnerable, creating impressive chemistry with Pike, who delivers a lovely feeling of stability and intelligence as Miriam comes to challenge Barney, building a life he feels compelled to destroy. The acting is uniformly marvelous here, filling the film with a critical sense of community to best isolate the schlub stuck in the middle of it all, serving up eccentricity and cultural nuances without deflating the deceptively fragile nature of the story. "Barney's Version" would lack a great deal of life without these specific talents finding compelling shadings to troubled characters. Buy tickets to "Barney's Version" now!